As quilters we have the added advantage of quilting a cushion if desired and the following three cushions can easily be quilted before finishing them. Regardless of your preferred method, making patio cushions requires Coats Outdoor Thread for longevity. If you missed yesterday’s post on the details of this very strong and weather resistant thread, it’s worth the read. 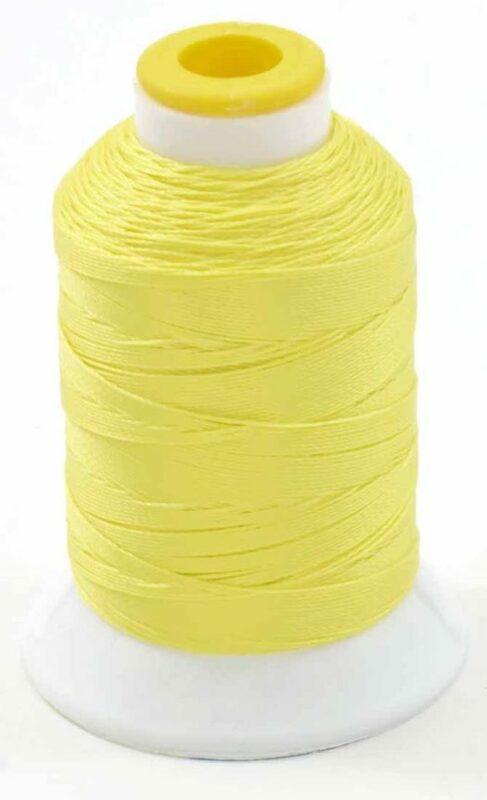 200yd spool of Coats Outdoor Thread in bright yellow! Karen Schaphorst designed these next three Simple Outdoor Cushions for Coats and Clark. You can choose from three finishes along with three backs for your cushions. It’s a well-done tutorial with lots of options for your outdoor space. The first and very simple cushion is the simple square where the front and back are the same fabric. This one is a great beginner cushion to make when learning how to sew for the very first time and particularly perfect if you wanted to try quilting the fabric and then making the cushion. Measure the pillow form across the center front from edge to edge. For a square or rectangular cushion measure both the length and wide. For a round cushion measure across the diameter. Cushion Front: Add a total of 1” to the length and width measurements for ½” seam allowances on all sides. 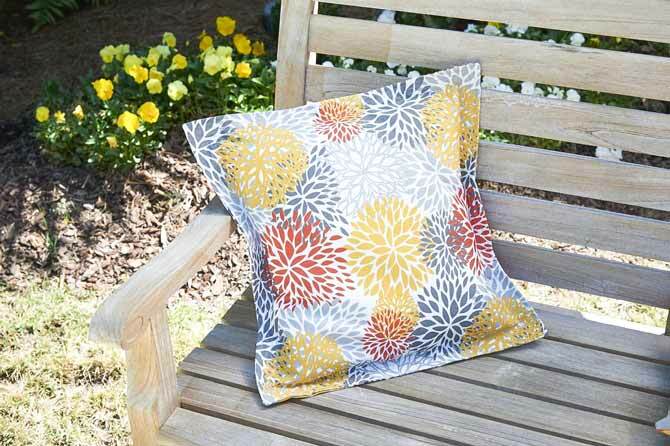 If your cushion top has a design, be sure to trim it to size so that the design is centered. For no zipper, add a total of 1“ to the length and width measurements. Cut one cushion back. For a zipper in the center back: Divide the width measurement in half, then add a total of 1” to the length and width or ½” to all sides. Cut two cushion back pieces. For an envelope cushion cover: Cut 2 backs the same size as the front. Fold under approximately ⅓ of the width on both pieces. 1. Pin the front and back cushion pieces right sides together. 2. Stitch around the pillow, ½” from raw edge, leaving an opening to insert the pillow form. On a square or rectangle cushion, start and stop on the bottom, 2” from the side edges. On a round cushion leave approximately one-third of the cushion open. 3. Trim corners and seam allowance, turn to the right side. Insert pillow form. 4. Turn under the raw edges at the opening. Hand-sew the opening closed using a blind stitch. Use a zipper 1” to 2” shorter than the cushion back pieces; shorten the zipper if necessary. 1. Place the back pieces wrong side up on the ironing board. At the center back, press under the seam allowance, ½” on what will be the left or underlap and ⅝” on the right or overlap side. 2. Place the underlap side on the zipper tape with the fold close to the teeth and with the zipper bottom stop ⅝” from the edge; pin in place. 3. Place the zipper foot on the sewing machine. Stitch the cushion section to the zipper tape close to the fold. 4. Lay the other side of the cushion back on the zipper with the fold just covering the stitching. Pin in place. Topstitch ⅜” from fold, edge to edge. 5. Open the zipper. Pin the cushion front and back, right sides together. Stitch around the cushion ½” from the raw edge. 6. Trim corners and seam allowance. Turn cushion cover right side out. Insert pillow form through open zipper. 1. Fold under ⅓ of the width of each back piece. Place one of the backs right side of the fabric facing up on a flat surface. Lay the other back on top, right side up so that the folded edges overlap. Machine baste the overlapped area in the seal allowance. 2. Pin the backs and the cushion front, right sides together. Stitch around the cushion using a ½” seam allowance pivoting at corners. 3. Trim corners and seam allowance. Turn cushion cover right side out. Insert pillow form through opening in the back. 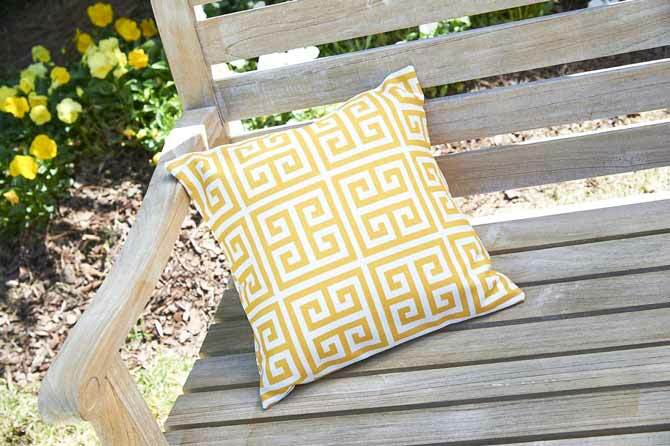 This simple square decorative cushion for your patio can be made simply or made using the envelope closure or a zippered closure as described above. Quilt the fabric before you assemble it for a unique and totally different look. 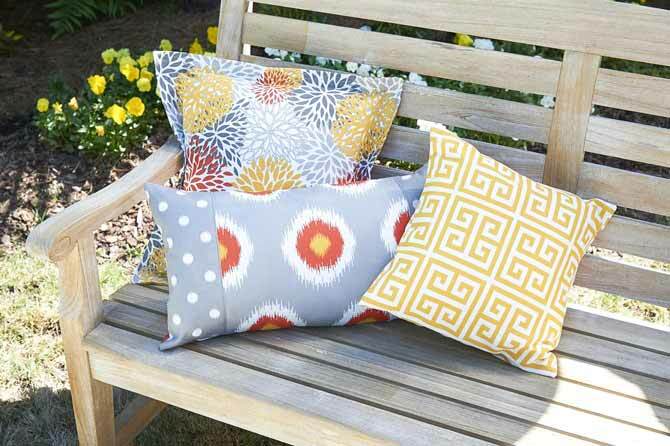 Join me tomorrow for the instructions for the Knife Edge Cushion using Coats Outdoor Threads! I didn’t know there was an outdoor thread either! Great idea – Now I am going to have to go find some! I use Coats thread for quilting – I hadn’t heard about outdoor thread. Thanks for the tutorials. This post could not have come at a better time for me. I never even knew there was such a thing as “outdoor” thread. I’m getting ready to make cushions for my sister’s outdoor furniture!! I’ll be buying this thread. Thanks so much! !